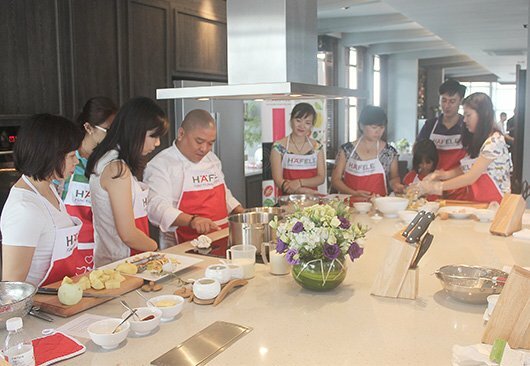 On 31 st Oct, the “Cooking with Häfele” class was organized at the Hanoi Häfele Design Center. 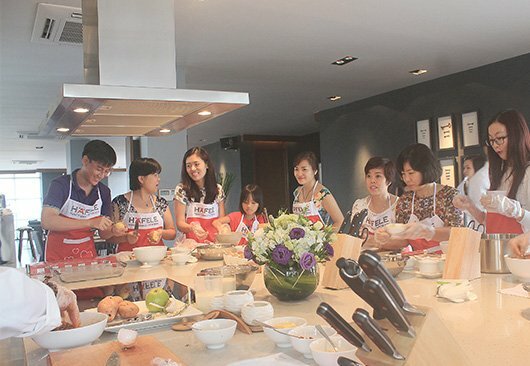 Hosted by Nguyen Van Tu - the master chief of Vietnam & Thailand 2012, 17 participants had a great chance to explore a wonderful cooking experience. "Pork roast with mashed potatoes and apple butter sauce" is the dish chosen to be practicec this time. Chef guided participants on how to choose the best meat as well as the way to marinate meat and prepare dish for both great flavour and nice looks. Despite the cold weather, the atmosphere of the "Cooking with Häfele" class was really warm as th partiipants were excited to create their dish using the luxurious and comfortable Häfele kitchen. Let’s wait the next cooking classes of Häfele!